Jamie Nole is from the Tahltan Nation and Nisga’a Nation of the Ganada House – Frog clan. She currently resides in Terrace, British Columbia. She is a multitalented artist with a natural creativity, helping her learn First Nations Fine Arts, Cedar Bark Weaving, and a variety of other artistic mediums. Jamie sold her first painting in 2011, and did her first commission in 2012. 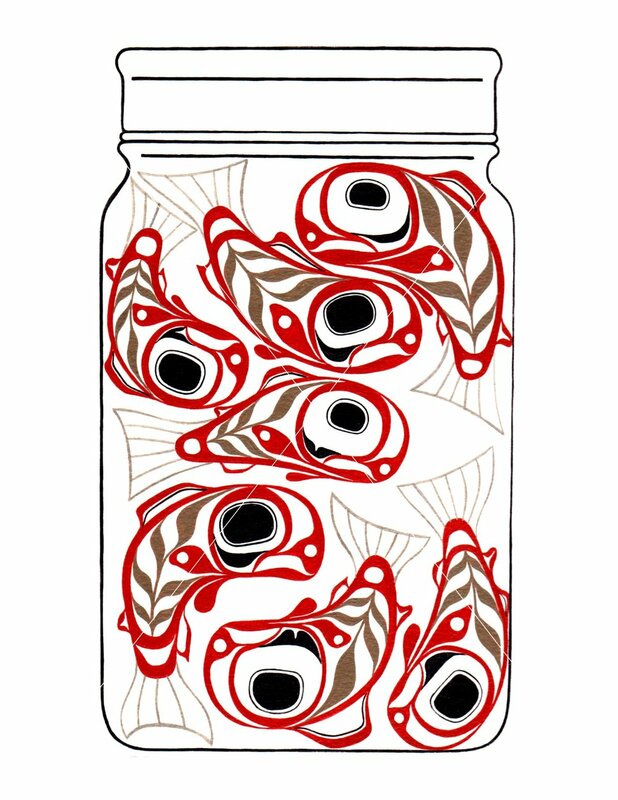 In 2013, Jamie won a design contest for the Terrace Nisga’a dance group. In 2014, Jamie won a contest designing a community mural with the Terrace Nisga’a Office, and later was contracted to paint the mural. In 2015, Jamie acquired her first set of limited edition prints of her painting the “Pregnant Frog Woman”. The painting has a lot of meaning to her and represents the start-up of her business Injane’s Art Life. Jamie also graduated from the Freda Diesing school of Northwest Coast Art in 2017, which is instructed and mentored by world renowned artist Dempsey Bob, Stan Bevan, Ken McNeil, and Dean Heron. Browse all of Nole’s accomplishments, interviews, and more. “Jamie Nole, a member of the Frog clan and from the Tahltan and Nisga’a Nations, has several paintings on wood and paper in the exhibit. Nole said art helped her deal with trauma in her life.